Kai is a fragrance created by Gaye Straza Rappaport, who wanted to capture the aroma of her vacations in Hawaii. It has something of a cult following (it was included in Style magazine's 2002 list of 5 Great Cult Perfumes) and has its own little celebrity fan base (Julia Roberts, Reese Witherspoon, Charlize Theron, and Naomi Watts are all rumored to wear it). The notes are gardenia, jasmine, tuberose, and lily. Kai is a relatively simple, easy-to-wear scent. It starts with sharp green notes and gardenia. The sharpness fades, and the gardenia softens as it is joined by the other floral notes, but gardenia remains the prominent note. For some time I lived in a house in San Diego which had several gardenia bushes just beneath my bedroom window, and when they were in full bloom, I had to close my window at night because the scent was so strong it would bring on a headache. Kai smells like gardenia, but it is not that gardenia. The green notes temper the sweetness of the florals, and once it calms it is very soft. It smells clean and fresh, but not aggressively so, and it does not smell at all soapy to me. Kai was originally released as a perfume oil. The lasting power is good, but like most oils it stays relatively flat and close to the skin. It comes in a 1/8 oz roll-on for $45. I like Kai. For what it is, it is well done, but it is not a complex or unusual fragrance, and I've never been able to bring myself to spend even the $45. A small amount goes a reasonably long way, so I have contented myself with samples of the oil. A year or so back, I did buy the Body Glow, a light body mist with a silicone and jojoba oil base. At the time, it smelled reasonably true to the scent, just much lighter, and for $28 for 4 ounces, it seemed like a bargain. This morning I am discovering that either I have a very bad memory and this is even more sheer than I recalled, or the Body Glow formula is not as stable as the oil. It is now so light that it is hard to make out the scent at all. 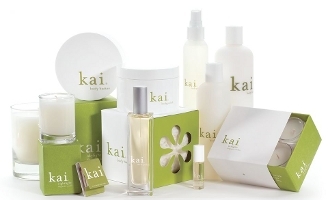 Kai is available at abeautifullife, apothia, beautyhabit, beautysak, eluxury, and luckyscent, among others. Update: in 2006, Kai was released as an Eau de Parfum. Interesting – I get no sharpness even at the start of Kai. It gets kind of close to sharp, but not quite. It opens like the smell of when you cut the stems of calla lilies to place in a vase for an arrangement, but not sharp. More at stem green, with the gardenia looming in the background at first. I agree, it isn't really complex, but it's lovely for what it is. Like you, I can't really bring myself to buy it either. I use a touch of my sample now and again, but once it's gone I doubt I'll miss it enough to replace it. i love gardenia. where can i get a sample of kai? K, I keep thinking I won't miss it too. Then when it is gone, I go looking for another sample, LOL. It is one of those “in between” fragrances that I want to have but won't buy. Beautyhabit and luckyscent both have sample programs! Hello R! I bought Kai a few years ago with the body lotion. It was nice and pretty but got bored and gave away the lotion and the little bottle. You lived in San Diego, R? I had no idea you used to live in California. Wish you were still out here. Anyway, I love the mystique of the gardenia, but I must admit that I am not a big gardenia fan. However, one of my closest friends loves gardenia, so when Kai was new to the market, I grabbed a roll-on and gave it to her for her birthday. She loves it! The only two gardenia fragrances that I have owned have been Annick Goutal's Gardenia Passion and Marc Jacob's fragrance. I quickly tired of them, however, and gave the former to my gardenia loving friend and the swapped away the latter. R, I went to graduate school at UCSD in La Jolla, and loved it so much that I stayed in the area for several more years, mostly in North County — around Carlsbad. I miss it terribly. I don't know if I am a big gardenia fan. I like the smell, but it isn't something I want to wear every day. Maybe your phrase “the mystique of the gardenia” is what I am after too. Hi N, Another “lukewarm” vote, LOL! Being a “chile 'o the South” I love the smell of gardenia and magnolia — but am always disappointed in products that try to capture their elusive FRESH vibrant qualities — the liveliness of the flower seems to disappear and become a monotonous sweet bore in perfumes. For those of you who have sniffed or grown the plant, IS there a scent on the market that comes even close to the real thing? I can see why you miss it terribly–La Jolla and Carlsbad are two of the most beautiful areas in Southern California. Honestly, not sure I can think of a real, true gardenia. Such a thing might be too much for me, personally! Well I guess that's what real flowers are for, heh? For me all the flowers that fade fast (cut gardenias last just hours before browning) have that “mysterious aire” about them. Don't even get me started on LOTUS…another impossible-to-reproduce aroma! What a coincidence — I had a big gardenia weekend, as I continue my project of culling all my fragrances and samples down to only the necessary few. I tried Chanel Gardenia (still hate it), Marc Jacobs (waffled on it for a bit but eventually decided I kind of hate it more than I kind of like it), Annick Goutal Gardenia Passion (hate it), Monyette (continue to hate it), and DSH Gardenia (very pretty, and I completely hate it). The odd thing is that I thought I liked gardenia up until this weekend, and now I realize that in fact, all evidence points to the conclusion that I hate it. This is bizarre. I have never tried Kai, though, and now I know that I never want to. Please, don't mention “culling” fragrances here, LOL. It makes me break out in hives. Wearing 4 of the DSH Gardenias at the moment, so I am on severe gardenia overkill and can sympathize with your feelings. I think as the creator of this blog it is your duty to tell us all HOW MANY bottles of perfume you possess at this moment: 3.4 oz bottles, 1.7 oz bottles, 1 oz, miniatures, samples, etc. HA! Post “A Day of Culpability” and shock us all with the numbers and names of what you have in stock. Culling can be easy…use “disappointments” as air fresheners…scent your envelopes and surprise the gas company…make your dogs odiferous in the best possible way. You would be surprised at how small my collection of actual bottles is, although I'm drowning in decants & samples — but not telling all the same!! I am in general a hoarder (books, CDs, you name it) so don't like to think about culling anything. This was one that I loved when I first tested it and forgot all about it. I really should test it again! All last summer, I craved a gardenia fragrance and never settled on anything – although I did buy a lot of gardenia candles and fragrance sachets so that my office could smell like gardenia. I adore gardenia, but Kai was very boring on my skin. It did not develop, just seemed green and floral, nice, but not outstanding, nor memorable. I also do not care for oil based perfumes (ok, unless I make them myself, but even now I am trying to do an alcohol base instead, as it makes diffusion easier). Too bad, as I was excited about it at first. Looking forward to more of your gardenia reviews! S, hmmm, suddenly I'm wanting a gardenia candle! Actually, Kai makes a candle but I'm sure it is more than I would pay. I agree that it doesn't really develop. Once the top notes calm a bit, it pretty much stays as is. And agree about oils. I am trying to learn to love them but it isn't going well so far. I like alcohol in my fragrance. First, I am new to your blog, but have been reading it daily for about 2 months and I love it. Thanks. Second, how do find Kai as compared to Child and Moynette? Before this spring, I eschewed most sweet florals, (being more of a chypre and oriental girl) now I am in love with them. I find both Child and Moynette creamy, lush and long-lasting. I find Kai, too green and transparent. Would like your thoughts. Welcome Cindy! You have described the difference between Kai, Child & Monyette perfectly: Child & Monyette are sweeter & creamier, Kai is greener and more transparent. I prefer Kai *because* it is greener and more transparent, but that is all a matter of personal taste. Hi M, Kai is not so hard to find in a B&M — I live in a perfume wasteland, and can find it near me. The Body Glow is probably worth it if you will go through 4 ozs faster than I did! Mine is probably about a year old and does seem to have faded. To my nose, this smells quite similar to Creme Bouquet by Stila. I used to wear kai all the time and loved it, now I'm kind of over it…it's getting old. I admit that I haven't reached for it in a long time either…there is way more competition now in the tropical perfume oil field. Actually I'm surprised they haven't come out with a follow-up scent. Kai comes off, on me, at best, pale and wan at the beginning, with a slightly consumptive elegance I wouldn't call attractive. It's fading is neurasthenic, and within an hour or so I can't even remember if I put on scent or not. I want to like it: sometimes I'm feeling pale and wan and neurasthenic. But I'd like to still be able to smell it at 10 a.m…..
Are you trying the oil or the newer EdP? I don't find the oil as you described at all, but haven't yet tried the EdP myself. You're right, I tested the oil, and I really like it. It lasted well overnight. So I bought the small bottle. Luckyscent sent me a sample of Monyette with my order, I'll have to try that. I never cared for the odor of gardenia flowers — too strong, too fleshy and overripe. But I do like Kai. Glad the oil worked better for you! yes, estee lauder's tuberose gardenia. smells just like a gardenia. you can only get it at saks, lord & taylor and neimans. if you ever try it, let me know what yoy think. how come you never diid a review on child? if you have i cannot find it, but would love to read it. Haven't reviewed it, sorry! Not a huge Child fan anyway. Strictly speaking, not a huge fan of any of these clean musk/tropical floral blends, although I do like a drop of Kai now and then. I am in love with Kai. Every May I buy the oil and it lasts me untill Fall. A little dab on pulse points lasts all night. It’s feminine and fits perfectly for warm summer evening out wearing sun dress with tan skin. My date told me my perfume (Kai) was intoxicating!